MTMC2 : She Craved for Daylight, and do Anything to Get It. She Craved for Daylight, and do Anything to Get It. Karli Rush loves her fans and like to write for readers, so here is her latest book Daylight, available on Amazon.com. Go to the link below and see what is waiting for supernatural, romance and vampires with a twist of Hot Graham the Grim Reaper, and sit down for a wild ride, a lingering story with the promise of more to come. Not just a love story. it is so much more. This can not be… This must be dealt with. Mattie desires two things, getting Daylight back and Him. 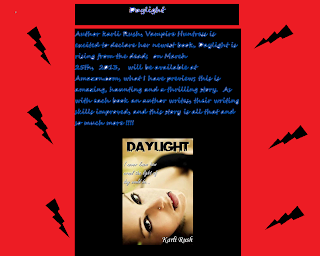 Go to this above link, and discover so much more, about Daylight, the author and her latest book. "I prolong the sensual glance long enough to affect her, mesmerized myself because she actually seems unfazed before she spills her drink. Empty of any raw emotions I don't take the time to linger and begin to scour for my next mark. But still, her haunting aphotic eyes reside permanently in the back of my mind. She's different than the others. And I sense this, even though I have never been close to her. Perhaps tonight my savoring for her will be quenched." The author has once again taken a modern tale, added vampires, witches, lusty sensual scenes and twists that stimulate a reader's mind, along with the love triangles, the mysteries, the sacrifices, and so much more to create a wicked story. Which all lovers of the supernatural, paranormal and glimpses of vampires' world all will relish. This story is a gritty tale of a female vampire and the Grim Reaper, and they bond through suspenseful events. Mattie the main character is a young woman coming of age, and resides with her maker, Mommy Dearest, who turned her. They do not get along, as the mother is a hungry thirsty selfish vampire and alcoholic. They get in to fierce fights and Mattie is neglected. She has to fend for herself, and it is Halloween Eve, and she hikes to a Halloween bash, and meets more then she bargains for. She is pulled in a dark world of needs and desires that cannot be quench, the thirst of the blood to the infatuation of a mysterious stranger. The tale spins into her breaking free and goes to the Big City of Solace to seek her independence and the secret to walk as the dead, not only at night, but in the daylight. She is thrust into the ancient dynasty world of the Elite Vampires, and is hired to be their servant in exchange for the serum. She is placed into tricky situations, and her knight in shining armor or death is Graham. He seems to appear at of nowhere when she is on the brink of danger and rescues her. In the midst of their events, they are attracted to each other and teased each other to the point of no return. The sensual details are compelling and sizzling, as they fight the Elite. The tale spins out of control and is wicked as the incidents are fast paced and enticing. The Piece of Resistance was the justice served at the ending, still echoing in this reader's mind. Definitely it is an addicted read and thrill seekers will enjoyed this age mature novel and addicting tale with a promise of more coming.